Want to learn which type of deadlift will provide you with the best results? Then you need to read this article. The deadlift can be argued as the single best exercise for strengthening and developing the posterior chain. Although the conventional deadlift is typically what pops into most people’s minds when they think of the deadlift, it’s important to note that there are other variations that exist. Two such variations include the sumo deadlift and the trap bar deadlift. …but may actually be the better option for you based on your specific anthropometry, history of injury, and mobility restrictions. But how can you tell which one is best for you? Well, let’s start by briefly going over how each deadlift is performed and then dive into what the differences are between them. The conventional deadlift, which is the most popular option, is characterized by a narrow foot stance with the hands placed just outside of the knees. This causes the conventional deadlift to have a more horizontal trunk angle during the setup than the other forms of the deadlift. The sumo deadlift, a popular alternative, is characterized by a wider foot stance with the hands placed inside the knees at about shoulder-width apart. 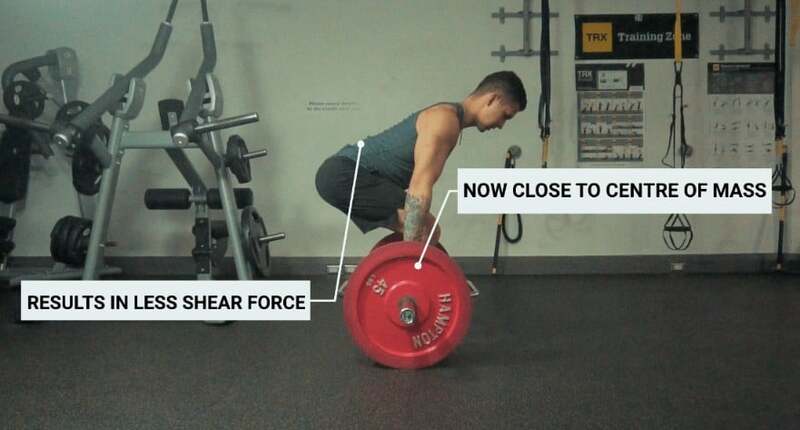 This causes the sumo deadlift to have a more vertical trunk angle and resembling more of a squat movement than the other forms of the deadlift do. The trap bar deadlift (or hexagonal bar deadlift) uses a different type of bar such that you grip the bar at your sides rather than in front of you. As a result, the trunk angle is slightly more vertical than the conventional deadlift but more horizontal than the sumo deadlift. Now these slight variations with each type of deadlift simply mean that one might be better suited for you depending on a few factors. And to start, let’s first take a look at the differences in the muscles worked. However, as made evident in the literature, each deadlift variation will emphasize certain muscles over others. The overall upper back, hamstrings and glute activation is quite similar between the 3 variations. But, since sumo and trap bar deadlifts are more squat-like than the conventional deadlift, they will actually emphasize the quadriceps a little more as a result. And this was tested and confirmed in two EMG analyses (one, two). Both analyses found that these deadlift variations resulted in roughly 20% greater quadriceps activation when compared to the conventional deadlift. On the other hand, since the conventional deadlift exhibits more of a hinge pattern than the other variations do, it’s going to place more emphasis on your lower back muscles. This is simply because they have to work harder to keep the back extended as the bar lifts off the floor. 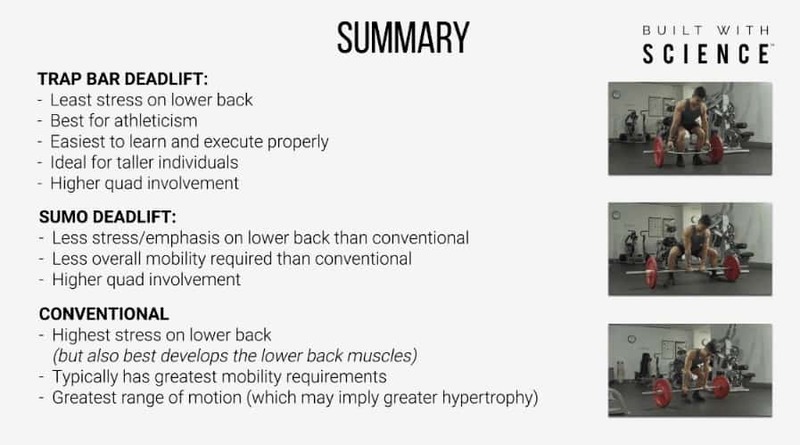 In fact, a biomechanical analysis by Cholewicki and colleagues has shown that spinal extension demands are roughly 10% higher in the conventional deadlift as a result. …and what does this mean for you? It means that one way to pick the best deadlift is by choosing which type of deadlift will best work your weakpoints. For instance, if your squat and/or quadriceps in general are relatively weak, then the trap bar or sumo deadlift may be the better option. Conversely, if your lower back muscles are relatively weak or you’d just like to develop them more, then the conventional deadlift might be the better option instead. But before making your decision based on that, you should first consider the next couple factors. The conventional deadlift will generally require the greatest mobility requirements to get into the right setup position. In addition, it will also place the most strain on the lumbar spine. The conventional deadlift elicits roughly 8% more shear force on the lumbar spine when compared to the sumo deadlift. This is mainly because the starting position is more horizontal during the conventional deadlift. …then the sumo deadlift would likely be the better option. But what may even be the BEST option in this case is the trap-bar deadlift. This slightly decreases the range of motion of the exercise. As a result, this often makes it much easier for beginners or taller individuals to set up and execute properly when compared to other deadlift variations. …enables the load to now be closer to your centre of mass. Translating into less shear force on the lumbar spine. While also making it easier for you to keep a neutral back throughout the lift! Meaning that if mobility restrictions and/or past lower back injuries are a concern for you… then the trap-bar deadlift is likely your best bet. But before making a final decision, let’s take a look at the last factor below. Training goals are important to consider when determining which deadlift variation will best suit you. For instance, if your main goal is to build more size and overall strength, then all three deadlift variations are viable options to do so. Do note however that research shows that the conventional deadlift has a 20-25% greater range of motion than the sumo deadlift and is greater than the trap bar deadlift. This may imply that it’s better for growth given the positive association between range of motion and hypertrophy. But in my opinion this fact alone wouldn’t be enough to say that its superior than the other variations for muscle size. 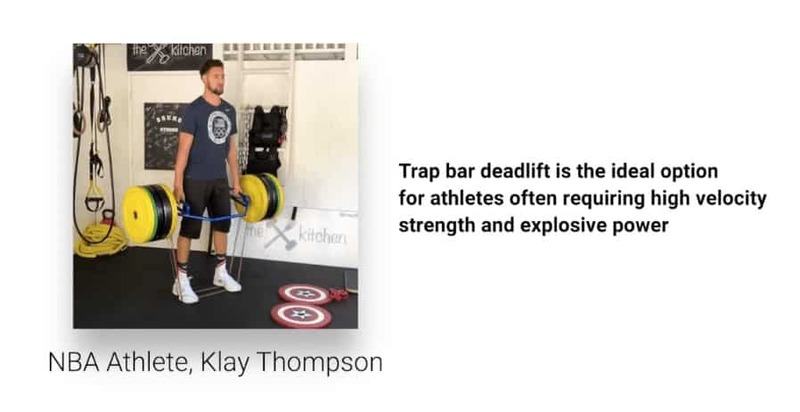 If your main goal is to improve your athleticism and to enhance your sports performance however, then the trap-bar deadlift would be the best option. In fact, most professional athletes (NBA, NFL players) tend to perform the trap-bar deadlift over the other variations. This is because three studies (one, two, three) have now shown that this deadlift variation involves greater force, bar speed, and peak power than the other variations. Therefore making it the ideal option for athletes who often require high velocity strength and explosive power. I do want to also say that it’s perfectly fine to alternate between the variations or incorporate more than one of them into your training. For many of you, this may be the best approach since each type of deadlift comes with their own benefit. Then join the thousands of other members today by taking my starting point quiz I have up in order to discover which program and which approach is best for you. The filming, additional body markings on you, and the explanations were excellent. Had this been available years ago, I wouldn’t have had to struggle through and would have made more progress and in less time. I’ve done all three variations. I noticed that if I look in the mirror from the side, I can judge my form better than from the front. One last point, I’m enjoying the workouts from the Intermediate Shred Program. I do, however, need to take pictures with me to the gym as a quick reference. The Bulgarian Split Squat wasn’t ever a part of my routine and I don’t know why. When I did it this afternoon, the quads were definitely activated. I put an upright bench in front of me and used 2 fingers for stability and a feeling of security. Thanks for the kind words Michael! Glad to see you’re progressing well and enjoying the program and my posts! Thank you for the highly and most professional presentation on deadlifts. Not every gym has the trap bar available. What are your thoughts on using dumbbells as an alternative to avoid lower spine stress and still incorporate deadlifts? Are knee level deadlifts worth the time and effort? I think they’re a decent alternative if you’ve got nothing else suitable!